CT Imaging Technology Brings a Modern Twist to Dentistry. Masella Family Dental is proud to have an on-site Conebeam CT Scanner for our patients. What do all of those fancy terms mean? They mean that we can offer dental services that are more predictable, successful, and not accessible to patients in most dental offices. Conebeam CT Scanners are essentially machines that take 3D x-rays of the head, neck, jaw, and oral structures. This 3D image is essential for offering detailed treatments that involve the bone of the jaw, location of teeth, and lining of the sinuses. When a patient wants to have dental implants, it’s important that there is enough healthy bone structure to support the implant. Traditional x-rays do not always give a true perspective of the quality of bone where the implant is to be placed. In most cases, dentists will be overly cautious in order to not place an implant where bone is inadequate. A 3D CT scan of the bone can pinpoint where bone levels are the highest, providing a computer-guided placement of the implant. What does that mean? 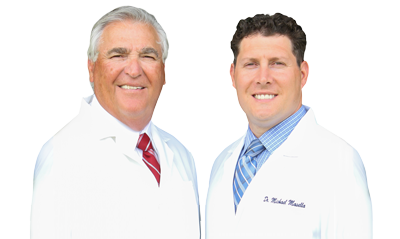 Masella Family Dental can provide comprehensive implant therapy to patients that might have been told by another dentist that implants were not an option for their oral health needs. If you’re considering orthodontic treatment like Invisalign, a 3D CT scan can allow Invisalign planning software to display your treatment process before it even starts. You’ll be able to see the gradual stages of tooth movement, from start to finish. The in-depth perspective of CT imaging technology allows Masella Family Dental to assess various aspects of your mouth from angles that were never available before. Complications like impacted wisdom teeth, jaw pain, and other types of conditions can be carefully inspected with just the touch of a button. How are Conebeam CT Scans Taken? Very simple! The equipment is integrated with our standard panoramic x-ray machine. You’ll stand very still with your chin on a rest, while our sensor circles around your face, several inches away. The image is instantly captured into our computer software for review with our patients. The entire scan takes 14 seconds. There is no small tube that you have to lay in for hours rather an open air machine that moves around you and seconds later your 3D image appears on the computer screen. Then Dr. Mike can plan and virtually perform the procedure before you even sit in the chair for treatment. Dr. Mike says the CT scan is like cheating, you know the outcome before you even start treatment.